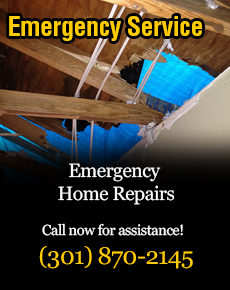 while increasing value for your home. With Maryland’s full seasons, the addition of a screened living space allows you to enjoy the life outdoors without insects attacking you. With the news alerts of the Ziki virus, mosquitoes are no longer a concern with a screened porch. A screened room is an excellent solution to start enjoying the outdoors without the hassle of bugs ruining your outdoor enjoyment. With a screened-in porch, you can take advantage of breakfast outside in the beautiful spring mornings and enjoy the summer evenings with friends and family without those pesky insects bothering everyone. Don’t forget about fall! When the leaves are turning, you can enjoy the outdoors rain or shine. 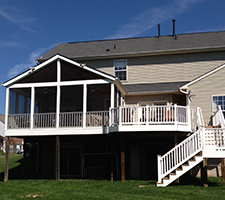 The state of Maryland’s weather allows screened room/porch owners to enjoy the great outdoors in a luxury fashion. When you make the investment in a screened room or porch you will see a return on your investment. Adding another living space to your home is a wise use of money. With today’s new construction materials, screened in rooms and porches become almost maintenance free. Composite decking and railings come in a wide verity of color choices and never need painting or staining. Keep in mind many homes that already have decks can be converted. With our skill and knowledge, our designers can turn your deck into a screened room! Get out of the sun. Enjoy a nice ceiling fan on those hot summer days… Bug-free! Oh yeah… there is nothing like enjoying fall football games on your flat screen TV in a protected screened room — rain or shine! Metropolitan Design/Build has been designing and building outdoor screened rooms and porches for Maryland homeowners for years. Let Metropolitan Design/Build create a spacious sunroom or screened porch which will allow you, your family, and friends to gather and relax and enjoy the outside regardless of weather conditions. No longer will you be limited by the weather conditions or be bothered by mosquitoes and other nasty pests. At Metropolitan Design/Build, we build our sunrooms and screened porches using only the highest quality materials. We would love the opportunity to provide you with an in-home design/build consultation for your screened room or porch.